Not only is Austin the capital of Texas, but this city has also been nicknamed the “Live Music Capital of the World”. For years, locals have vowed to “Keep Austin Weird” and this commitment has only formed Austin into one of the more eclectic and diverse cities in the country, with a passion for small local businesses and artistic scenes. Austin is probably best known for SXSW Festival, an annual mid-March display of music, interactive media, and film that continues to grow each year. Austin City Limits is also one of the city’s most popular events and is a pilgrimage for music lovers each year. Austin is a city filled with some amazing natural phenomenons, like Inner Space Cavern, Hamilton Pool, Barton Springs Pool, and Mount Bonnell. Congress Avenue Bridge is famous for the 1.5 million Mexican Free-Tailed Bats that emerge at dusk and can be seen from all over in this magnificent and spooky experience. Some other great attractions in Austin include the LBJ Presidential Library, the Texas State Capitol, Lady Bird Lake, Bullock Texas State Museum, and the Driskill. Finally, you’re in Austin, and when you’re here, you better find yourself some good Austin BBQ. Favorites include Franklin Barbecue, Stiles Switch BBQ, and Iron Works Barbecue. Austin continues to grow and diversify as a city, and has become one of the best places to live in the country. Locals love to look back at “Old Austin” and keep those roots strong in this incredible Texan city. Howl at the Moon is the country’s biggest name in Dueling Piano entertainment. Howl2GO delivers our amazing, high energy show to any venue in the Austin area. 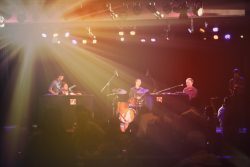 When you bring Howl2GO to Austin, you can be certain you’re getting the true Howl at the Moon experience, and with that comes the assurance you are booking only the best dueling piano performers in the country. Our fun, energetic performers are perfect for all events anywhere in the Austin area. Howl2GO provides all the production you need to make your event look and sound amazing. We have top of the range PA sound systems and custom built lighting shows that you will not see anywhere else. Our competition simply does not begin to come close to our production! We also supply our custom built electric baby grand pianos that can be transported into any size or shape venue in the Austin area. Regardless of how many guests you’re expecting, from 20 to 2000, we have you covered! Howl2GO Dueling Pianos by Howl at the Moon brings only the absolute best entertainers to your event. Whether you’re planning a corporate event in Austin, a wedding or private party at your home, we’ll deliver customized entertainment leaving you and your guests dancing and singing along all night. We are the first choice for all types of school, church and charity fundraisers and we ensure all our songs and material is suitable for everyone in attendance. Telling your guests in Austin that Howl at the Moon is providing the entertainment, is a sure fire way of attracting more people to your event! Dueling Pianos in Austin is all we do! Howl2GO has a dedicated team of professionals on staff. From our sales manager who will help build out your vision, our production team who will communicate with your venue in Austin, a wedding specialist and, of course, our world-class entertainers, picked specifically for your event. We only bring Howl at the Moon trained musicians, all of whom have experience playing at one of our locations nationwide. We are a perfect choice for your wedding – we keep numerous couples in Austin and their guests dancing all night, as well as taking care of all your ceremony, announcements and special family dance needs. Don’t risk booking a local fly-by-night company that may not even still be in business when your wedding date comes around, nor one that hires freelance players. Howl at the Moon has been rocking since 1990 and our reputation precedes us. We have a dedicated reviews page so you can read testimonials from hundreds of our thrilled clients in Austin. Our Facebook page features regular updates, and following us on Instagram and Twitter means you’ll stay up to date on where we’re playing next near Austin TX.